Today bosses in every sphere are embracing the possibilities of the latest technology to ‘improve productivity’. This is capitalist-speak for getting workers to produce more than they did before in a given time period which means the company gets more unpaid work out of each worker. It is the essence of capitalist exploitation. It doesn’t always mean lower pay. At the top end of the ‘value chain’ companies like Nissan, the biggest car-manufacturing firm in the UK, can invest in more robots, as they have done for welding of the new Infiniti luxury brand, to boost output without necessarily cutting wages or extending working hours. This is still increased exploitation and work on the production line remains intense and tiring. In fact the fundamental cause of the world capitalist crisis is at the top end of value production, where the rate of return on capital is now so low as to discourage further capital investment. Despite capitalism’s debt mountain (now equivalent to more than 2 years of global output) the world is awash with financial capital looking for higher rate of return on its investments. Increasingly finance is directed at services which have been farmed out, often from the state sector, and turned into businesses which can turn a financial profit but where little or no new value can be created. He’s not the only capitalist who’s sorry. 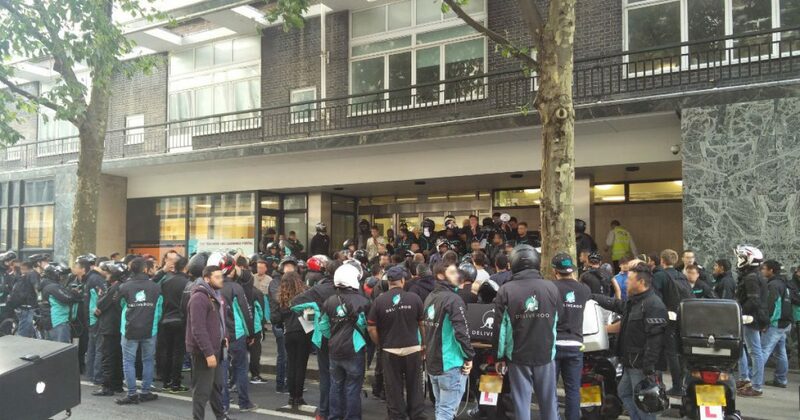 The Deliveroo workers’ fight inspired Ubereats couriers who came up against another wage-cut trick to organise their own “wildcat strike”. After initially paying £20 per hour, once Ubereats had recruited a core set of workers, the pay terms were changed to £3.30 per delivery, which means much lower pay. The workers used their mobiles and Facebook to organise their protests in conjunction with the Independent Workers Union of Great Britain (IWUGB) and the United Voices of the World Union. The first is a split from the modern version of the IWW (Industrial Workers of the World), and before that from mainstream unions in the TUC, we do not know the origins of the United Voices of the World. To the extent that they are using the grievances of precarious ‘gig economy’ workers to capture a membership that will allow them to get a foothold as the workers’ permanent legal representative they are not the way forward. As it is though, it is clear that by putting up their own fight, these most precarious of gig economy workers have shown the glimmer of a way forward to the rest of the working class. See G20 Leaders Urged to ‘civilise capitalism’, Tom Mitchell et.al. in Financial Times 6.9.16. I am so impressed by this article that I am resuming commenting, hopefully to general benefit. A short part of my working life was on a data-processing self-employed basis on low income, but the flexibility of time was helpful to my situation. Absence of a contract meant that when I eventually asked for higher pay per hour, I was told that the firm would 'just have to let me go', so I went, and luckily (?!) found a waged job, from which I eventually resigned, only to go to another 'flexible' set-up. Anyway, if I and millions of others find that they don't have to get 'employment' in order to eat etc, if and when the wage system is abolished, as advocated by CWO, then with the element of fear removed, what motivation is there for workers to do any work, apart, of course, from the overall understanding that things need to be done to produce food and everything else ? Vouchers for time worked would be a controversial pain, liable to all sorts of rackets. If abolution of the wage system is the only solution to the capitalist system, then moneyless organisation needs to be very carefully assessed and explained, or workers won't 'buy' it ! I vaguely remember that maybe CWO has already explained as I now request, some time ago, but please repeat t for present day readers, and maybe update it. Cheers.